This French theologian and Genevan pastor is one of the most preeminent of all the 16th-century Christian reformers. After learning about Martin Luther’s teachings, Calvin passionately embraced Reformation beliefs, sharing his conversion story in his Commentary on the Psalms. Writing this book of Psalms commentary put Calvin at great risk, given that many of his fellow believers were being martyred at the stake for their beliefs. He was not daunted, however, and another of the John Calvin books is now known as Protestantism’s magnum opus: The Institutes of the Christian Religion. Additional books of note include A Guide to Christian Living, which offers clear direction to believers, and encouragement to everyone wanting to live according to the Gospel; and Truth for All Time, this book written to show French monarchs the beliefs of Protestants in the country. Modern translations by Dr Rob Roy McGregor of sermons preached by Calvin in 1559-1560. Suitable for Christians at all levels of spiritual development. 888 & 920pp. Calvin’s superb ‘A Brief Outline of the Christian Faith’. Translated by Stuart Olyott. 156pp. Also available as a small paperback. A clear, balanced set of directions and encouragements to all who desire to live according to the gospel. Translated by Robert White. 128pp. Calvin excels in bringing out the principles of God’s dealings with men, as individuals and in covenant, and in showing faithfully yet tenderly the human weakness and sin all too evident in Genesis. 1088pp. There is scarcely a commentary on any portion of the Old Testament quite so profitable as Calvin . . . on Daniel’—Wilbur Smith. 816pp. 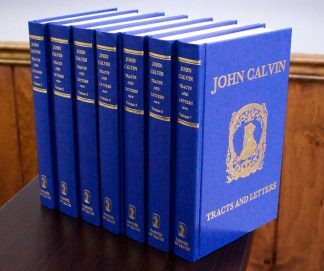 Long unavailable, the republication of Calvin’s Tracts and Letters will delight all who have come to appreciate the 16th-century reformer’s writings—3 volumes of tracts; 4 volumes of letters. 456–592pp. per volume. Calvin’s superb ‘A Brief Outline of the Christian Faith’. Translated by Stuart Olyott. 96pp. Also available as a Gift Edition Pocket Puritan. In these extensive expositions we encounter Calvin’s great gifts as an exegete and theologian, but we also see how his experience as a pastor and preacher equipped him to produce this outstanding work. Approx. 2800pp.